COME JOIN ME AT THE FREIGHT FOR A FREE SING-ALONG! In September, I had the pleasure of being one of the cast-of-many who ushered in Shay Black's sharing the 1000th song of his Freight teaching career at the Freight & Salvage, where he teaches Folk Song Repertoire. Above is a photo of that event, but it's representative of what you'll encounter at the free (yes! FREE!) Celtic Song Sing-along that he and I are co-hosting on Sunday, October 14 at 1-2:00pm (doors open at noon). If I were you, I'd go out for Sunday Brunch, and then join us for an hour. You'll still have time to go home and deal with your laundry. 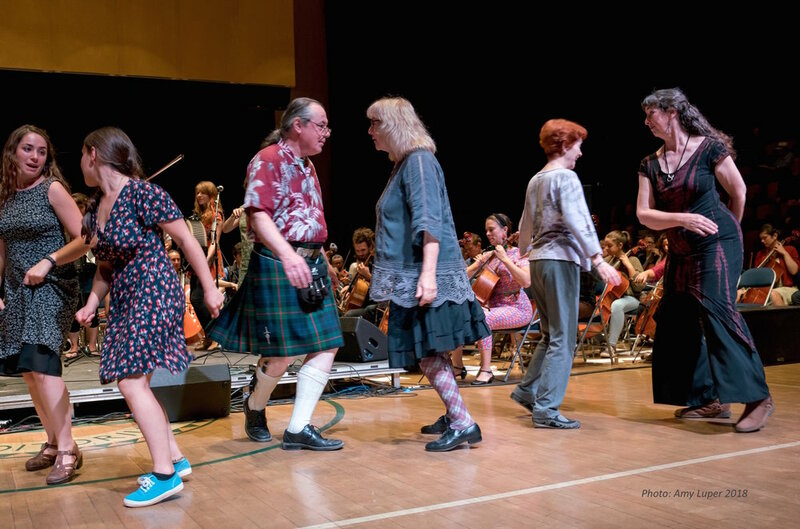 We will be singing songs from both Scotland and Ireland, and the lyrics to such songs as Connemara Cradle Song, When the Yellow's on the Broom, Song for Ireland and Will Ye Go, Laddie, Go? will be on a screen for your convenience. No instruments, please--it's all about da voices. Why come? Because singing is medicine for the soul! I really believe that because of how I feel when I sing--either alone in the shower, or with any number of other people. But if you don't believe me, watch this very short video of Professor Sarah Wilson from the University of Melbourne discussing what singing does to your brain, or this longer TED talk by Tania de Jong. Even if you don't take time to watch that second video (it's about 25 minutes long), it's fascinating. She asks folks to hold up their hands if they've ever been told not to sing. It's the majority of the audience. What if all babies were encouraged to sing as well as talk (and in my book, dance as well as walk?) This is one of those skills we have great capacity for, if only we never heard there was something wrong with a deeply personal part of us--our voice. So I encourage you to come and join us on October 14--it will really feel good to all of us! Kent and I hope you'll come to our place in North Berkeley to hear the Quixotics, a Sonoma-based trio singing tight harmonies in an eclectic mix of genres that range from Lyle Lovett to the McGuire sisters; from French pop to Hollywood cowboy classics. The widely varied musical backgrounds of Kim Hughes, Cynthia Tarr, and Jennie Nourse, bring spice to their vocal arrangements. Together their voices create a unique and surprising blend that you'll love! We suggest a donation of $20 per person - all proceeds go to the musicians. Plenty of seats, but please reserve in advance (it helps us know how many chairs to put out), and if you need further information, email me! Free wine and snacks following the concert! I know I mentioned it in the last newsletter, but I just want to say once more, how much I loved being at VOM Fiddle Camp a month ago. I met many wonderful folks, and caught up with a few I haven't had a chance to see for awhile. There were prickly Scottish thistles (how apropos!) near my tent, and I had a lot of fun teaching and dancing folk-style bourée, prompted by Laura Cortese in her fiddle class. The skill level of all the teachers AND students was truly remarkable!